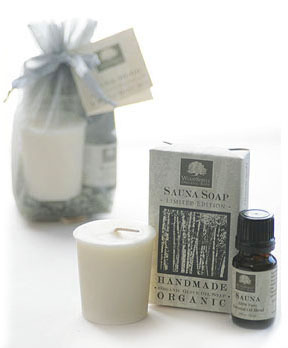 You don't need to have a sauna to enjoy this special set, inspired by the Finnish Sauna tradition of Northern Michigan! Our unique, refreshing signature Sauna Blend features stimulating sweet birch, soothing sassafras and the grounding aroma of fresh juniper, to encourage opening of the breath and cleansing of the pores. Our special edition soap, soy aromatherapy candle and pure essential oil will bring the purifying ritual of the Northern woods to you, any time of the year! Presented in a Shimmering Reusable Organza Drawstring Bag ready for gifting. Earn 28 Loyalty Points when you buy this item!